Follow baking directions on sugar cookie pouch, dividing dough evenly into 12 round cookies. On cooled cookies, draw a “snow puddle” with Betty Crocker™ White Cookie Icing. TIP: Draw the outline of the puddle, then go back and fill in the shape. MAKE THE ARMS: Once the icing and marshmallow have set, pipe two “branches” onto each cookie using black gel. Add fingers with chocolate sprinkles. MAKE THE FACE: Using a small dot of white cookie icing, stick two “coal” eyes and a nose onto the marshmallow with Rainbow Chips. Pipe a small dot for the mouth with black gel. MAKE THE SCARF AND BUTTONS: Using blue, red, or green cookie icing; carefully draw scarves around the base of the marshmallow. Using a small dot of white cookie icing, stick three “coal” buttons beneath the scarf with Rainbow Chips. Allow cookies to set for at least one hour before serving. 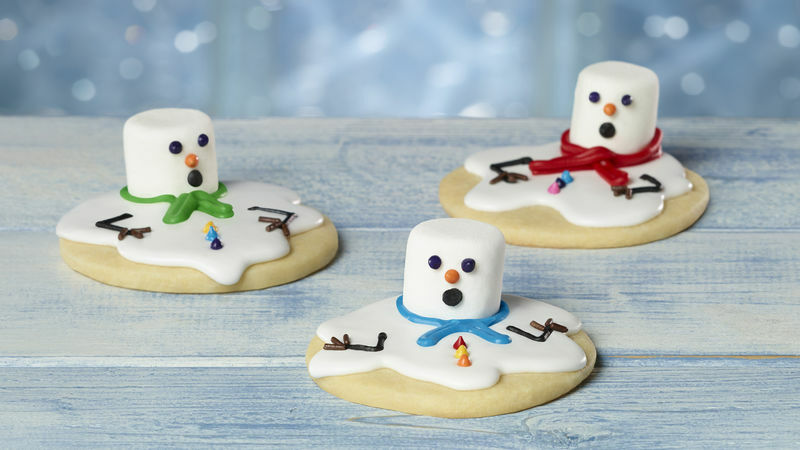 You don’t need a corncob pipe for your snowman, a dot of decorating gel will do the trick when making this recipe for melted snowman cookies. Cute as a button and easy too, these cookies come together with a handful of ingredients, which makes them a perfect last-minute party dessert. They’re sure to delight kids of all ages. In fact, these cookies are even more fun when you’ve got little helpers on hand. Whether they’re up for frosting or just adding the marshmallow topping, there’s a job for everyone. So keep your pantry stocked with Betty Crocker sugar cookie , and you’ll have an activity to keep everyone occupied come snowy days! And if you’re baking for the holidays, check out the rest of Betty’s Christmas cookies. If you’re feeling extra ambitious, you can always make these using Betty’s classic scratch sugar cookie recipe. Learn all the ins and outs of making this recipe in our article about how to bake sugar cookies.